PLD UIN Sunan Kalijaga: Could 3D printing provide new solutions for disabled people? You don't have to hear to be able to listen! 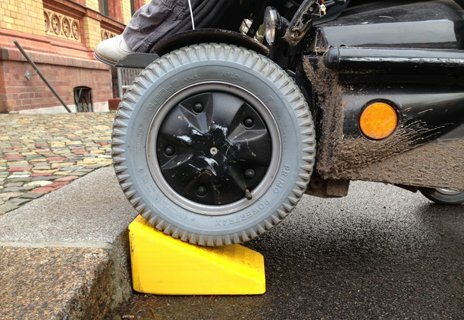 Could 3D printing provide new solutions for disabled people? Disabled people often need personalised equipment to help with their individual needs. 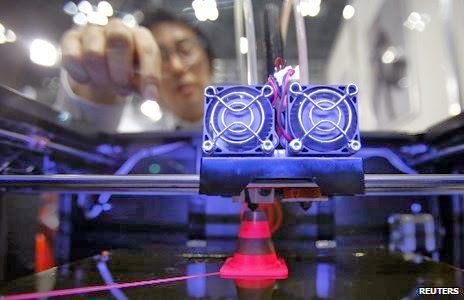 Could 3D printing provide a cheap and efficient solution? Disabled Berliner Raul Krauthausen bought himself a 3D printer a year ago, thinking that it might be fun to make iPhone cases and key chains. After a while he wondered if he could create something more useful for himself. "I decided to print a ramp because I am a wheelchair user. I often have problems getting into places with just one step in front of the entrance. I thought it would be good if I could carry one with me on the back of my wheelchair, not too big and not too heavy." Krauthausen taught himself by watching online tutorials. He created a portable pair of plastic chocks - textured on one side to prevent tyre slippage - to help him over occasional steps. He says it needn't be a complete solution for it to be helpful: "I have to ask someone on the street to put the blocks in place but that's not a showstopper. Sitting in an electric wheelchair as I do, you're used to asking people for help." The plastic printing materials cost Krauthausen 50 euros and each part of the ramp took 26 hours to print on his printer. In December he posted the resulting design file to 3D sharing site Thingiverse with the message: "This is my first prototype. Please feel free to print and to develop it. Any feedback is appreciated." Krauthausen says that followers on Facebook did challenge him to build the same device with Lego: "I ordered 600 Lego bricks and my flatmate and I constructed the same ramps. We found that building it with Lego was much faster, it took only 30 minutes, and cost about the same price." Only simple plastic objects can be printed on 3D consumer equipment and generally work well as prototypes. Some users of the Thingiverse site have uploaded design files with disabled people in mind. For instance, you can download a playing card holder, a pen-holding device or a right-angle spoon, all ready for printing. One enthusiastic user is currently sharing a design for a white cane. Admitting to knowing little about the blind market, he or she says the diameter might be wrong - and it's also not the colour you might expect: "Please forgive my yellow 'white' cane. I just couldn't resist (and I'm running out of white)." Accessible equipment is often obtained from disability professionals or specialist shops. Many complain that these can be unattractive, costly and don't always work very well. Denise Stephens, founder of Enabled by Design, imagines that in the future, mainstream products could be made accessible by only partially customising them. "My dexterity isn't good," says Stephens who has multiple sclerosis, "so it could be that buttons on a product could be more textured and so easier for me to press. "I suppose I have a dream you could buy products online and, just before checking out, you could say what customised elements you'd like. They could be 3D printed and would be tailored to your needs." Special equipment can often be expensive as demand is relatively small. Raul Krauthausen says: "It's better to be able to print a wheelchair cup holder and make it available for 10 euros." He suggests that currently you can find yourself paying something like 100 euros for a small piece of specialist equipment manufactured and sold in the old way. Warwick University has been running a project at nearby Hereward College for people with "complex support requirements" to create their own assistive products. 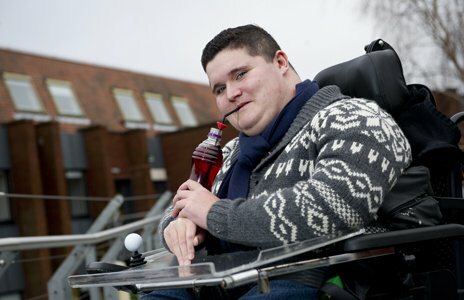 21 year-old student Oliver Baskaran, who has limited movement, described his difficulty drinking when out socialising: "When a bottle is quite full the straw comes out, it falls out when you tip it too." Thanks to his new printed "bung" which holds a straw firmly in the top of any size of bottle, Baskaran now takes it to the pub and can enjoy a drink independently. "I had to get my head round it, I'm not used to this kind of thing but after five sessions I started to get the hang of it," says Baskaran. "With the design software, you can move it around, look at it from different angles, zoom in, zoom out to tweak, smooth up edges. A full 3D view." Baskaran says that without this technology he would have to find a specialist to make him things, which could take a long time. The 3D printing method took "an hour to make and minutes to print out".